Acuvim-L may be used as a data gathering device for an intelligent Power Distribution System or a Plant Automation System. 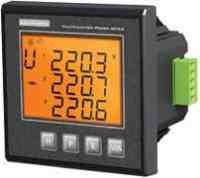 All monitoring data is available via digital RS485 communication port running Modbus Protocol. The quality of the power system is important with increasing use of electronic loads such as computers, ballasts or variable frequency drives. With the Acuvim-L power analysis option, any phase current or voltage can be displayed and the harmonic content calculated. By knowing the harmonic distribution, action can be taken to prevent overheated transformers, motors, capacitors, neutral wires and nuisance breaker trips. Redistribution of the system loading can also be determined. Two (2) parameter may be set within a specified time interval. If indicated parameter is over or under its setting limit and persists over the specified time interval, the event will be recorded with time stamps and trigger the alarm DO output. The indicated parameter can be selected from any of the 35 parameters available. The Acuvim-DL/EL model can extend the I/O module. Digital input, pulse counter, pulse output and SOE can provided by extention I/O module. Two digital outputs can be configured as pulse output for kWh and kvarh. The pulse rate and width can be set. RS485, industry standard Modbus RTU protocol; Option the second RS485(just for Acuvim-DL/EL), Modbus RTU protocol. Clear and large character LCD Screen display with white back light; Wide environmental temperature endurance.